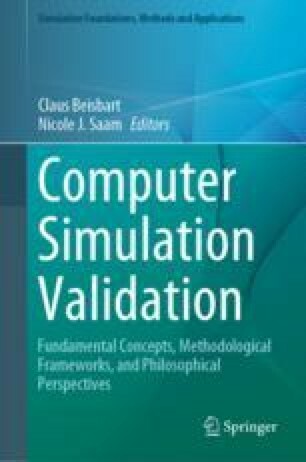 This chapter discusses the issue of choosing the best computer model for simulating a real-world phenomenon through the process of validating the model’s output against the historical, real-world data. Four families of techniques are discussed that are used in the context of validation. One is based on the comparison of statistical summaries of the historical data and the model output. The second is used where the models and data are stochastic, and distributions of variables must be compared, and a metric is used to measure their closeness. After exploring the desirable properties of such a measure, the paper compares the third and fourth methods (from information theory) of measuring closeness of patterns, using an example from strategic market competition. The techniques can, however, be used for validating computer models in any domain. I should like to thank Dan MacKinlay for his mention of the K-L information loss measure, Arthur Ramer for his mention of the Hartley or U-uncertainty metric and his suggestions, and Vessela Daskalova for her mention of the “cityblock” metric. The efforts of the editors of this volume and anonymous referees were very constructive, and have greatly improved this chapter’s presentation. Marks, R. E. (2013). Validation and model selection: Three similarity measures compared. Complexity Economics, 2(1), 41–61. http://citeseerx.ist.psu.edu/viewdoc/download?doi=10.1.1.401.6982&rep=rep1&type=pdf.